A photographic visit to the Trans-Bay and City Streetcar Lines of the Key System and its Affiliated Street Railways in Oakland, Berkeley and East Bay cities, 1902-1958. Dreams don't always come true. The promoters of the rail lines which became the Key System had their sights set on San Jose and Sacramento-as a high-speed electric competitor to the Southern Pacific. However, a lack of money and the business cycle (and perhaps even the great San Francisco Earthquake) thwarted Key's plans. The Key instead re-focused itself as a suburban commuter railroad, aggressively pushing its competitive technology advantage in the East Bay, with suburban electric lines fanning out from the new pier and ferry terminal to serve communities in Oakland, Berkeley and developing satellite communities. During its construction, the Key System overlaid an existing network of street railway lines, most of which were swept up into the holding company's corporate structure. 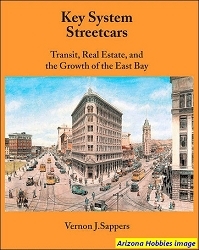 In reality there was one holding company and one home shop, but streetcars and transbay trains historically stayed out of each others way. After 1946-1948, both streetcars and suburban trains were painted the same and lettered for Key System Transit Lines. Keys new suburban cars operated on their own (new) tracks, physically and electrically separate from the streetcar services. In this book, the author examines both the street railway and suburban lines as if they were one company. Ch. 6: A Key System Bus Sampler, pp. 88-96. Shade Tree Books, softcover, 96 pages, 8.5 x 11 x .25 in., B&W photographs with captions.